The internet’s answer to literally any engine-related question, ‘Put an LS in it‘ seems to be the default setting for most YouTube commenters, and – although it pains us to say it – not without good reason. Compact, plentiful, powerful, and even available off-the-shelf new in ‘crate’ form, General Motors’ iconic V8 has been in use since 1996, powering everything in their line-up from sports cars to trucks. The LS has since found its way into a myriad of other vehicles, often thanks to the fact that whilst the engine was good many of the cars in which it was originally fitted were complete crap, making it readily available for pocket-money in breakers yards. Previous bloggee Simon Przepiorka has built a car that could be based on any number from the depths of YouTube, and it looks – well – awesome! Simon’s classic ’70s Datsun 240Z features a wide-arch kit, custom aero, and – of course – the obligatory LS V8-swap under the hood. Flickr’s Simon Przepiorka is becoming something of a regular here at the Lego Car Blog with his superb Speed Champions scale replicas. This is his latest, Nissan’s 370Z in NISMO specification. Cunning techniques are in abundance and there’s more to see at Simon’s photostream via the link above. Nissan’s R35 series GT-R is getting – in car terms – pretty ancient now. It’s been 10 years since the design launched and yet, despite the continual price rises and the advancement of newer rivals, the GT-R is still capable of dispatching supercars costing three times as much a decade later. The GT-R does feel its age inside though, where it’s miles off the pace compared to a modern design, and – oddly – it doesn’t actually feel as fast as it is, so hushed is the engine by the twin turbos forcing air into it. It is though, an absolutely cult car, helped hugely by Nissan’s partnership with all manner of racing game developers which has immortalised the GT-R in pixels, but it’s also a car that seems to rarely feature in Lego form. 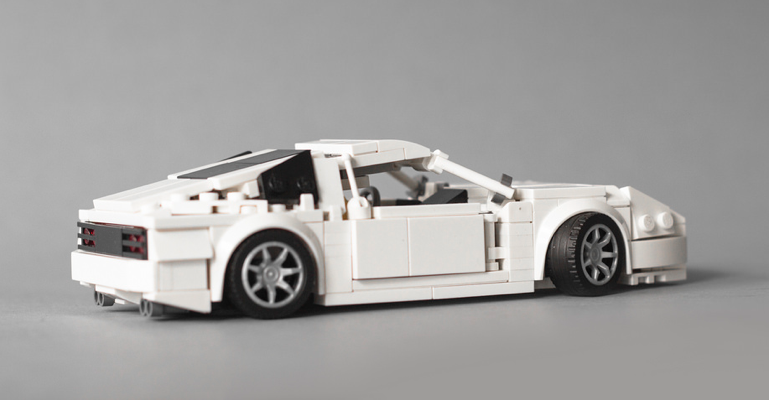 Previous bloggee (and one half of Master MOCers LegoExotics) Jens Matuschek has decided a Lego version was way overdue, and he’s built a spectacular replica of the GT-R in 2008 NISMO specification. The car features opening doors, hood and trunk, and includes a beautifully detailed engine and interior. There are loads more superb images available to view at both MOCpages and Flickr – click the links to see the full Nissan GT-R NISMO gallery. Built by previous bloggee Filsawgood of Flickr, this neat Technic Nissan D21 Hardbody is one of our favourite trucks of the year. It’s also one of our favourite trucks in real life, being the total antithesis of the hateful Dodge Ram and its ilk. Filsawgood’s recreation of the little Nissan looks the part thanks to a few well designed Model Team style details, and it’s packing some decent Technic functionality underneath too, including remote control drive and steering and all-wheel suspension. There’s lots more to see at Filsawgood’s photostream – click the link above to get hard. No sooner had we published a reader review of LEGO’s infamous buggy motor than two Elves returned to TLCB Towers with a Buggy Motor powered creation. Maybe they can read after all? The first of their Buggy Motor propelled finds you can view below, the second is this; Filsawgood’s brilliant 1991 Nissan D21 Hardbody pick-up. Like today’s other blogged model Filsawgood’s D21 uses the combination of a Buggy Motor driving the rear wheels, a Servo for steering, and a third-party SBrick for control via bluetooth device, plus there’s all-wheel suspension and custom stickers. The D21 hardbody is also a damn cool antidote for our deep-rooted loathing of the pick-up truck genre at the hands of hateful crap like the Dodge Ram. You can see more of Filsawgood’s glorious early ’90s Nissan at both Flickr and Eurobricks – click the links for the full gallery, build details, and a video of the truck in action. …First you must finish. Unfortunately for Nissan their strikingly designed 1989 R89C Group C racer was uncharacteristically un-Japanese when it came to reliability, with all three Le Mans entries retiring before the race was over. Sadly the R89C fared little better in the World Sports Car and Japan Sports Prototype Championships, suffering from chassis and engine issues throughout the season. The R89C is not exactly a legend of endurance racing then, but just look at it! Making almost 1,000bhp from its twin-turbo 3.5litre V8 engine the R89C packed quite a punch when it was working too. This gorgeous Model Team replica of the classic Nissan racing car is the work of Alexander Paschoaletto and he’s recreated the R89C’s magical shape (and Nissan’s famous late ’80s – early ’90s livery) beautifully in brick form. You can see more of his build on both Flickr and MOCpages – click on the links to take the trip to ’89. This neat modified Nissan 180SX was discovered by one of our Elves on Flickr. It’s the work of VovaRychkov and it reminds us of a time when Nissan’s European line-up wasn’t entirely made of crossovers. There’s more to see of Vova’s classic ’90s Nissan at his photostream – click the link above to make the jump. In the 1980s the World Rally Championship was at its most spectacular. Space-framed, wildly unstable and sometimes downright dangerous all-wheel-drive monsters raced through the world’s forests and deserts as part of the lethal Group B experimental class. Not to be outdone World Endurance Racing mirrored the WRC’s turbo-charged excess with its own ludicrous Group C class, where cars like this incredible Nissan R92CP produced over 1,200bhp in qualifying specification. Like WRC’s Group B, the Group C endurance class was axed after a few short years, but the cars it created have lived on much longer in racing legend. Previous bloggee Greg998 has an impressive catalogue of historic racing cars and his latest is one of the final Group C greats. His stunning 1992 Nissan R92CP is available to view on MOCpages, Eurobricks or Flickr.